if you ask me where i come from i have to converse with broken wings. this is a line. and all love is agreement, each day of living: an agree or a disagree. and love is not what we think it is. what we have been told it is: agree or disagree. i am telling you how to read me. neruda wrote: if you ask me where i come from, i have to converse with broken things. with the beings who arrived. who had the glasses of the heart. we are the beings who arrived because we had the glasses of the heart. we are the broken beings who arrived with glass for hearts. poetry is instrument; allows us to see through thought. thank you for saying my work does not sound like it is in translation, thank you for not saying my work sounds like it is in translation we are all the proof i need as singularity approaches us they ask with intrigue: how did you construct your blackness in america? each question requires a reconstruction. and i am always re never constructed in egypt, they ask: do they hate us? i pretend not to know who they mean by they what they mean by hate but i know because i live with they and aint they. aint they? we have to stop pretending we are not [capable of] winning and i know you know we know when i dip you dip we dip this one goes out to all the women in the world you see me everywhere i go they want to know which one i am and more of? still, you see me. the mask i wear is not leo rising but the colonizer’s falling and still, you see me. and when i say you see me, what i mean is: you feel me. we, we: the beings who arrive. i am in the backseat. my father driving. from mansurah to cairo. delta to desert, heliopolis. a path he has traveled years before i was born. the road has changed but the fields are same same. biblical green. hazy green, when i say: this is the most beautiful tree i have ever seen. and he says, all the trees in masr are the most beautiful. this is how i learn to see. out of the living room window. this is how trauma learns to behave. how i learn to push against the page. i always give hatem the inside seat. Both of these works came to me while I was at Cave Canem Retreat in 2016. The first is written for my CC cohort, GROUP C! and is in the form of the Zuihutsu. It is meant to address the feeling of belonging in unbelonging; the variation that exists in Black diaspora; the arrival and departure of being, and the peace that can be found in community; it travels through time and the world, borrowing from Neruda and yes, Freak Nasty, too. The second was inspired by a skinny-necked palm in a window that seemed to stare me down each day as I walked to workshop. I developed a deep empathy for the palm as I saw what it saw. It was the only of its kind, looking out at the beautiful deciduous and coniferous vegetation on University of Pittsburgh-Greensburg campus. Marwa Helal is a poet and journalist. Her work appears in Apogee, Hyperallergic, TheOffing, Poets & Writers, The Recluse, Winter Tangerineand elsewhere. She is the author of I AM MADE TO LEAVE I AM MADE TO RETURN (No, Dear/Small Anchor Press, 2017) and Invasive species (Nightboat Books, 2019). 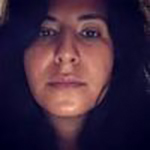 Helal is the winner of BOMB Magazine’s Biennial 2016 Poetry Contest and has been awarded fellowships from Poets House, Brooklyn Poets, and Cave Canem. Born in Al Mansurah, Egypt, Helal currently lives and teaches in Brooklyn, New York. She received her MFA in creative nonfiction from The New School and her BA in journalism and international studies from Ohio Wesleyan University.